Caves are supposed to be dark, dank and cold, where bats and creepy critters make their homes. They are supposed to be prime spots for horror or science fiction stories, places you certainly wouldn’t want to spend a night. But there are certain luxury hotels out there on this planet that redefine these preconceptions. There are no bats with razor-sharp fangs, or strange echoes that keep you up at night, or Gollum-like creatures. Instead, you relax in a plunge pool amid stylish modern décor, or connect with your business partners via free Wi-Fi amid sleek furniture and pleasant lighting. When you stay in these places, from Turkey to Arkansas, you won’t want to leave. Cappadocia is sight to behold in itself, boasting a surreal landscape formed for thousands of years by the lava flow of Mount Erciyes, complete with underground tunnels connecting cave dwellings. 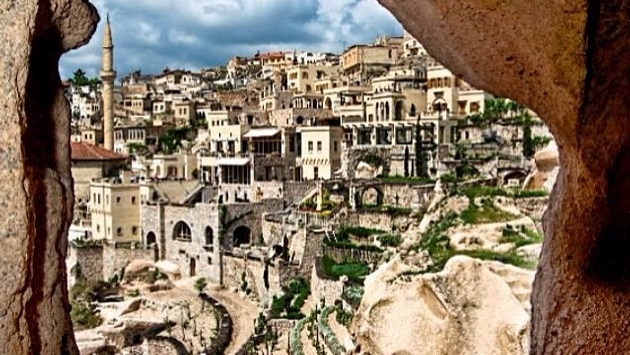 One such cave dwelling is Argos in Cappadocia, which features 53 rooms inside a former monastery. Suites such as the Splendid suite come with their own plunge pool and terrace, and the Bezirhane underground concert hall is internationally known for its natural acoustics. Wine cellars and top-notch meeting spaces also accommodate the wine connoisseurs and businesspeople of the world. Locanda di San Martino Hotel Thermae boasts 33 rooms based in ancient cave dwellings but renovated with modern furniture and amenities, including free Wi-Fi. But the Italian hotel makes its name with its spa complex, which resembles the bath of the Roman Empire. Multiple water treatments are offered in several rooms, including the antitepidarium (featuring a statue of Medusa’s head), the tepidarium (featuring a hydromassage tub) and the calidarium, or hammam. It’s hard to go wrong in Matera, whether you are staying at Locanda di San Martino or Le Grotte della Civita. Le Grotte della Civita boasts 18 cave rooms and a restaurant, and a renovation spanning 10 years nicely blended the old with the new, featuring recycled wooden furniture, limestone arches reflecting warm colors and flower-adorned patios. There are also luxurious massage treatments available, incorporating new age music, scented oils and herbal teas. Le Grotte della Civita isn’t overly ornate or glitzy, but that doesn’t mean it’s not a luxury hotel. This is subtle luxury, from the candlelit bathtubs to the top-notch service. Grand Canyon Caverns offers an inn featuring 48 rooms at ground level and the Caverns Suite. The Caverns Suite is 200 feet by 400 feet with a 70-foot ceiling, it’s 220 feet below the surface, its walls span back 65 million years, darkness surrounds you, and you’re the only living thing in the area (there’s no humidity so flies or bats won’t be bugging you). Inside the room, you’ll find a double bed and living room, a fold out sofa, a working record player and old books and magazines, including a National Geographic collection spanning back to 1917. The Sala Silvermine Mine Suite is the deepest hotel room in the world, located 509 feet below ground. Inside, you’ll find a comfortable bed, warm lighting, sofa chairs, and space for a candlelit dinner. You’ll also receive a tour of the surrounding caverns and crevices, a basket full of food and beverages, and breakfast in bed. Don’t expect to have all the modern luxury amenities at your fingertips in this mine, but you are centered in a historic spot dating back to medieval times and boasting breathtaking underground bodies of water. Located within the mountain of Gotthard Massif at a former Swiss army base, La Claustra Airolo is both underground and 2,050 meters above sea level. Seventeen rooms are carved from the mountain’s walls, as are hotel and conference facilities. Rooms offer air conditioning, TVs, telephones, hair dryers, Internet access and mini bars, so no need to worry about being too cut off from the outside world. There’s also a Jacuzzi and a library inside the attractively lit underground area. Of course, you don’t have to go to an extravagant vacation paradise to find a luxurious underground wonderland. You can also go to a small little town called Parthenon in Arkansas. Beckham Creek Cave Lodge only offers five rooms (good for about 10 people), but each room is spectacular. Set inside a cave adorned with cascading foliage, the hotel features fountains, luxurious couches, golden-sheeted beds, sparkling bathrooms, unique doors and even foosball and shuffleboard. Add in the surrounding wilderness and the variety of hiking trails, and there’s a lot to like about the intimate experience inside Beckham Creek Cave Lodge. The Kokopelli’s Cave Bed & Breakfast is set in a picturesque cliff cave dwelling. If you reserve it, you reserve the entire cave space, which features a Jacuzzi and waterfall shower, a cozy living room with comfy couches, a kitchen and bar with breakfast essentials, and an entertainment center with a TV, a VCR and a DVD player. Dinner meals are also catered for special occasions. And for those wanting to stay for multiple nights, surrounding sites to explore include Aztec Ruins, Chaco Canyon, Mesa Verde, Monument Valley and 4 Corners Monument. Fan of Lord of the Rings series? Not a fan of the Lord of the Rings series? Either way, you’ll love the “Hobbit homes” at Woodlyn Park in Otorohanga, New Zealand. The two units can accommodate up to six guests each and include showers, bathrooms, unique furniture and a cool design using polystyrene blocks (the units heat up during the winter, and cool down during the summer). In addition to the Hobbit Homes, Woodlyn Park incorporates a Bristol Freighter plane and a World War II-era patrol boat converted to five hotel units. The sweeping countryside surrounding the Hobbit homes will make you feel like you are living in a fantasy world. Then again, maybe you are. France’s leading troglodytic hotel, Les Hautes Roches is set in an 18th-century mansion that once housed monks. Incorporating a cliff side into its design, the hotel features luxurious rooms winding through the rock, complete with unique amenities and accommodations, including fancy lighting and a stylish decor, plush couches and unique art. All of this is embedded within tufa rock, which feels like velvety fabric and is known for its health-promoting qualities. Add in Breton-inspired cuisine, and you have yourself a luxury experience worth exploring. Call yourself a cave explorer if you wish.